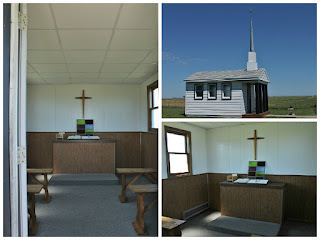 Our second stop in South Dakota took us on a short journey to Plankinton on July 31st. 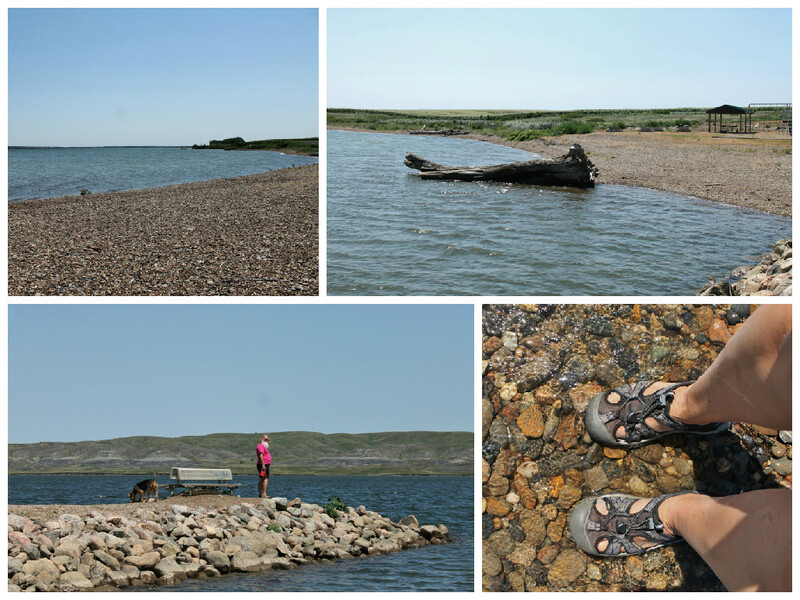 Both the town and the campground were on the small size. The town had a small market, couple of churches, couple of bars and a post office that actually closes from noon to 1:00 for lunch. We know this because that is the hour that we decided to go and mail some packages! 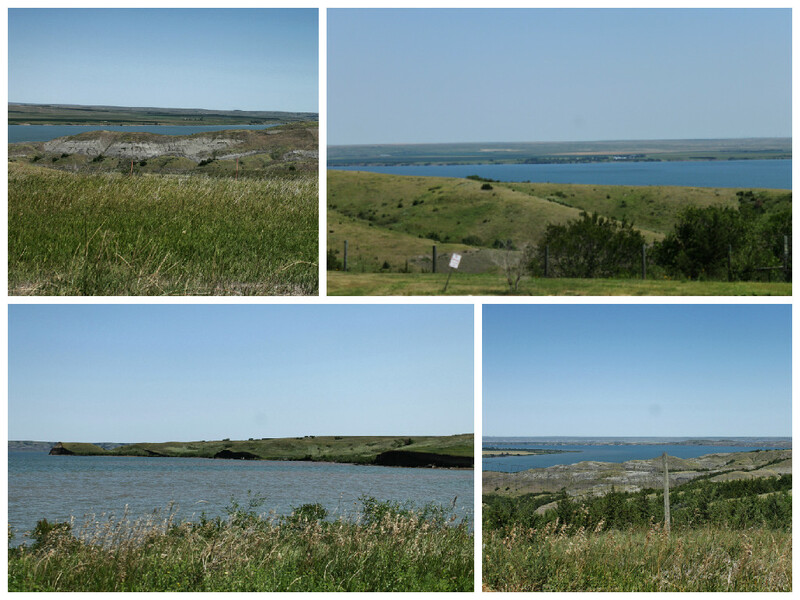 Hill RV Campground has about 40 sites that are on the small size. 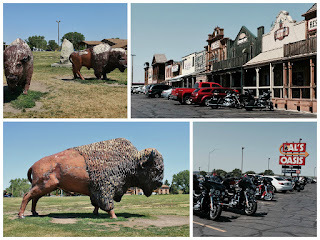 It is right on I-80, so there was a bit of highway noise, lots of motorcycles heading to Sturgis that week. The weekend nights were much quieter. No frills to this place. There is a small building where you do a self check-in. There are no fire pits on any site and only a few had picnic tables. The grounds were pretty well maintained. They have a small pool, but it costs an extra $2.00 a day to use. The camp was surround by farm fields, which of course is no surprise. Nancy, the owner was very nice and made some good recommendations of places in the area. In White Lake, SD we found a tiny church. It is at one of the rest-stops on I-80 and there is one East bound and West bound. Al's Oasis, one of the largest rest stops we have ever been in. A huge gift shop, a small grocery store and a restaurant. 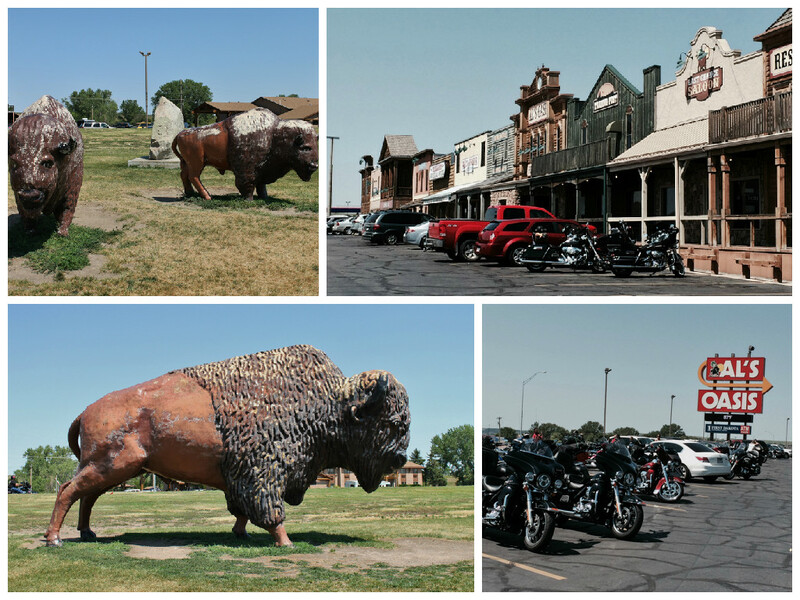 The day we stopped the parking lot was full of bikes on their way to Sturgis. There is a large buffalo and two small ones on display across the street. Farmer is a very small town that is home to a stone grotto. 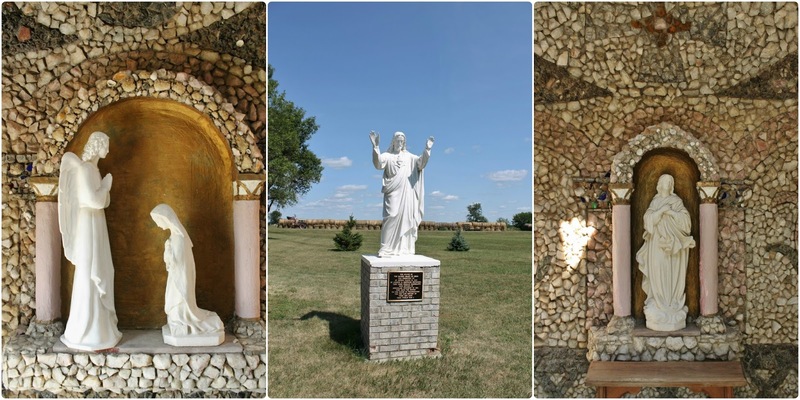 This one is nothing like the Grotto of Redemption in Iowa, but it is very pretty. It sits in the yard of a Catholic church. The National Waterfowl Refuge is north of White Lake, SD. 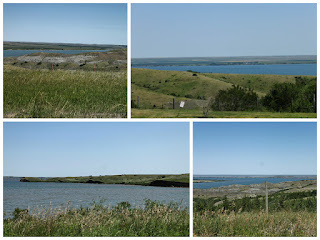 There is a road that wraps around part of the refuge and through the middle of the lake. We saw lots of cranes, ducks and other birds. We also saw a ton of pelicans. Yes, pelicans. 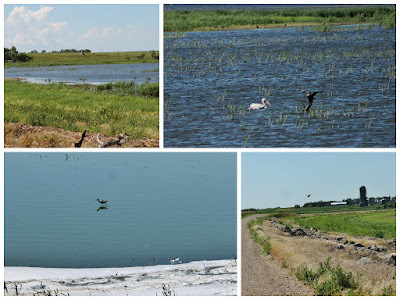 When we first spotted them in North Dakota they were farther out in the water and we thought they were swans, we had no idea that there were pelicans in North and South Dakota. We saw this sign as we were driving through the middle of the lake, not sure where you are supposed to turn. 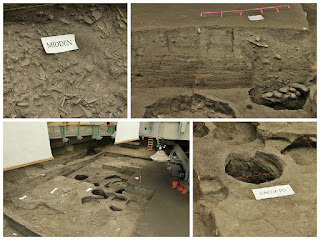 We set out one morning for Lower Brule in search of an Historical Indian Village and an Elk Ranch. We were sure we would see elk this time. Nope. We couldn't find either one. 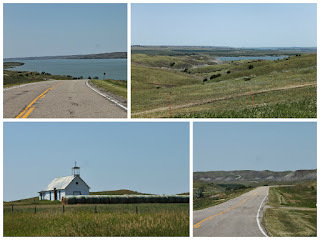 Like most times, the trip wasn't wasted, we drove through some beautiful country side. The rolling hills covered in grasses and wildflowers were amazing. 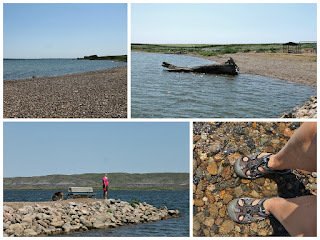 We found a nice park and were able to put our feet in the Missouri River. This section of the river is called Big Bend, as it meanders back and forth for 30 miles before straightening out and heading southward again. While searching for the Indian Village we managed to get ourselves on a road that turned into a tractor path. We were following the river so it was a very pretty spot, but we were glad we weren't in the RV. Les had to back the car up for almost a 1/2 mile before there was space to turn around. Lower Brule is on Lakota Tribal Land and their main office building is very interesting with a large Tepee on the back of it. 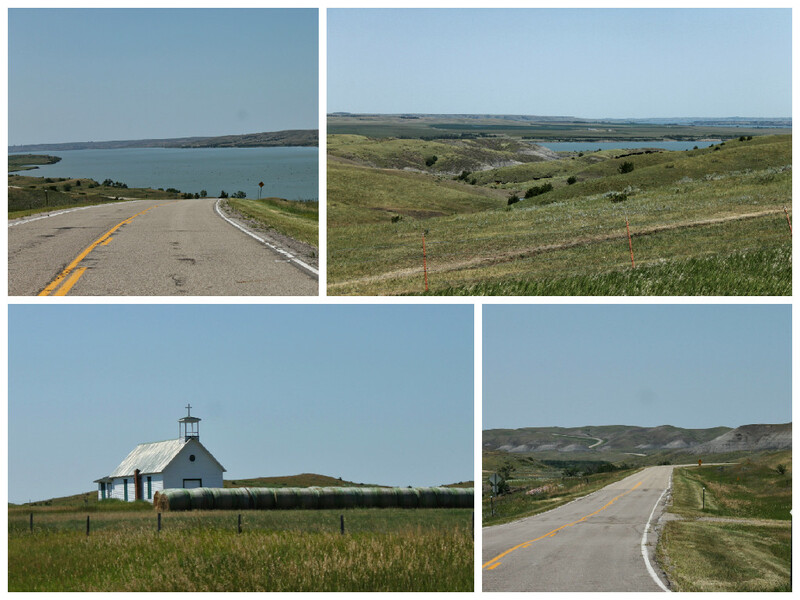 Our drive home treated us to amazing views of outcroppings and rolling hills. Mitchell is the corn haven of South Dakota. It has the only Corn Palace in the world. We read mixed reviews of it but we loved it, it was just quirky enough for us. The outside is covered in large murals made from rye, oats, sour dock and of course corn. 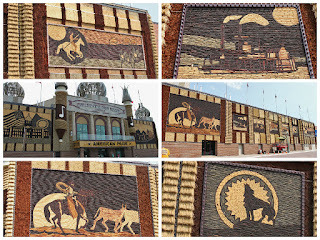 3000 bushels of rye, oats, and sour dock are used and 275 thousand ears of corn are sawed in half and nailed over the mural drawn by a local artist. A corn by number painting if you will! 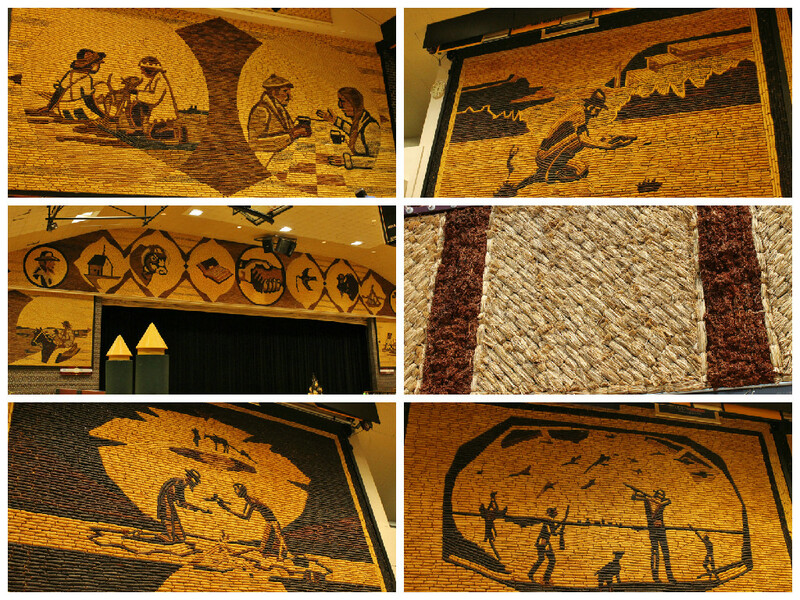 It is considered a folk art wonder of the world. 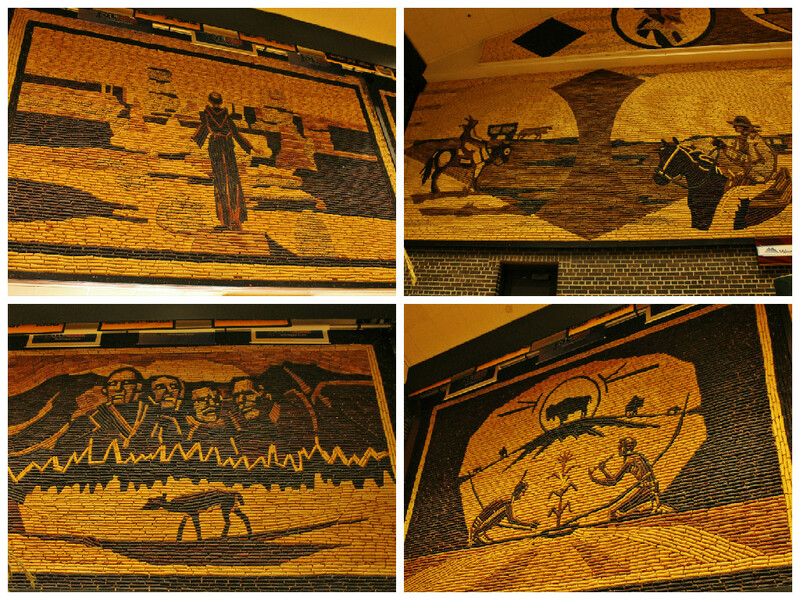 Inside, the arena is lined with murals as well. The town has a number of stores and restaurants. Nancy got to sit and chat with a grumpy farmer. 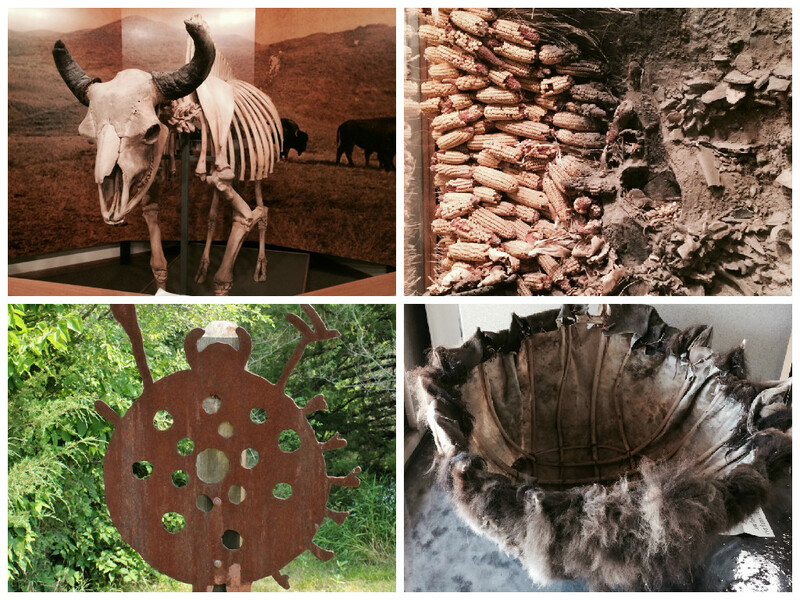 While in Mitchell we also visited the Prehistoric Indian Village. Dogs are not allowed so Nancy went in alone. You start off in a small building that has a gift shop and some displays. You watch a video, that is about 20 minutes long and could really be about 10 minutes. Then you get a quick tour of the displays while the guide tells you the things you just heard in the video. The guide was a young girl and she did a great job but it was a little repetitive. They have built a building over the dig site, which is really quite brilliant. They can work year round no matter what the weather is like. The dig site was pretty interesting. The whole process took about 45 minutes, so Les opted to not go in and just hear about and look at the pictures later. 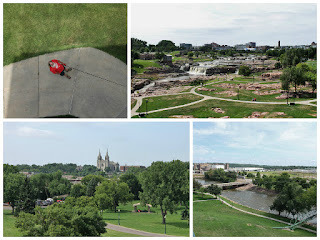 Sioux Falls - Another charming little town, with a number of things to do and see. 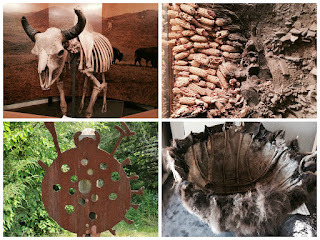 We found a few roadside oddities. A memorial in Sherman Park of USS South Dakota BB-57 Battleship. It is a cement outline of the ship with the guns, anchor, and center of the ship inside the outline. The center of the ship is a building that houses the museum. 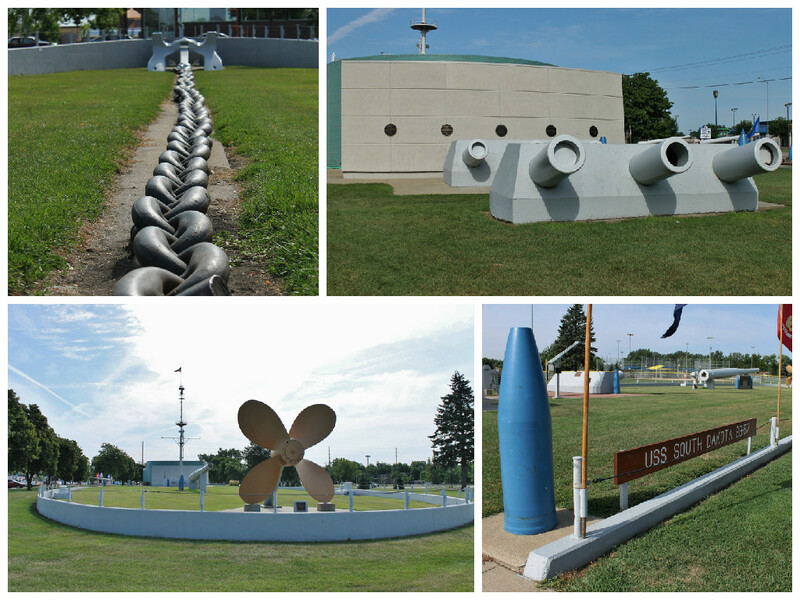 It is filled with memorabilia and pictures from the sailors and their families. 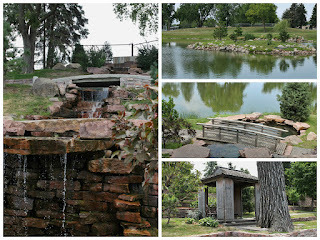 We stumbled upon the Japanese Gardens in Terrance Park. It was a nice little stroll by the river. There was a stone waterfall that ran under a small bridge. A number of little gazebos and covered sitting areas. There was a small island in the middle of the river and a row boat tied to the shore for anyone to use. 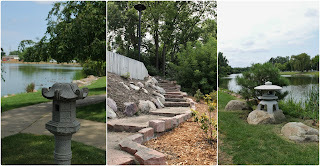 The walkway and stairs were made from decorative stones and a number of lanterns lined the path. A Mama and her ducklings stopped to pose for a picture. 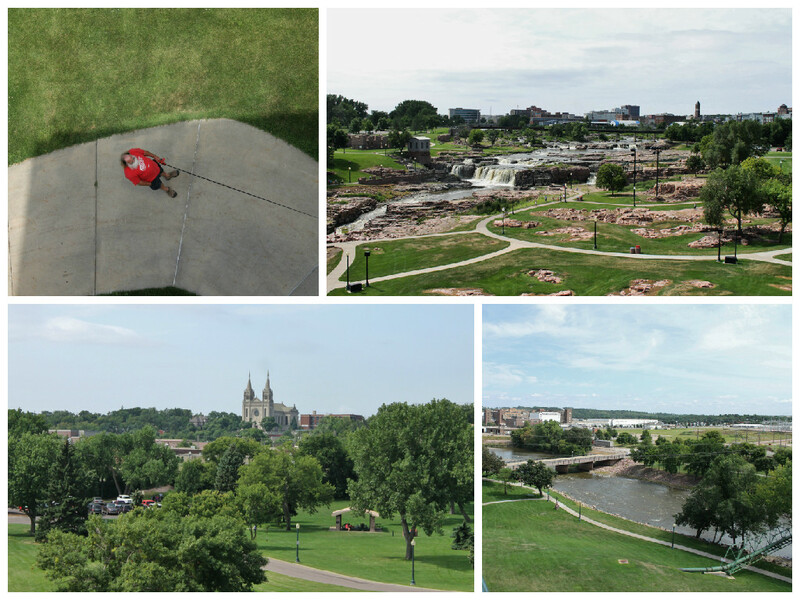 In the heart of Sioux Falls is Falls Park. It is the most amazing place. There are not enough words to describe it. There are at least 10 different falls all ranging in size from small to large. The falls and river cut their way through the red Sioux Quartzite, which was used to build many of the local buildings including a prison. In 1881 prisoners did the mining of the Quartizite that was used for the buildings on the prison site. 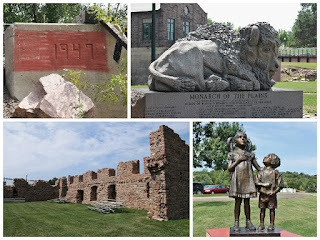 While the prison was being built a number of prisoners were sent to Detroit, MI to serve their sentences until they could be returned to South Dakota. A little local history with a Michigan connection. In the waterfall park is a restaurant that overlooks the falls, statues and an observation tower that allows you a nice view of Sioux Falls. We spent a couple of hours here enjoying the falls. 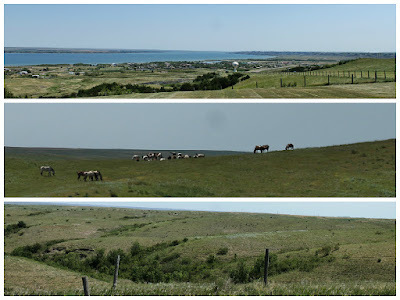 Garretson is north of Sioux Falls and is the place where Jessie James, riding as fast as his horse could gallop, jumped a ravine in 1876 to escape a posse. It is called Devil's Gulch, and it is a bottomless pit. There is now a foot bridge over the opening. Many years ago a 600 foot plumb line was dropped into the water and it never reached bottom. Indian lore believes that the canyon was formed when the Spirit, Iktomi hurled his tomahawk in anger at a warrior named Ha-Schootch-Ga. When the tomahawk hit the ground, it burst with lighting and a great wound appeared in the solid rock. There is a hiking trail that runs along the river and takes you from Devil's Gulch to Split Rock Falls. At the falls you can also take a river boat tour. 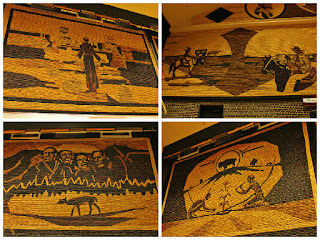 On our way out of Garretson we found two murals. The continuing saga of the hydraulic leveling jacks.We finally got the cylinders fixed that were causing the leveling jacks to not go up and down properly. We have had the parts for a few weeks now. Les wasn't sure this was going to be as easy as everyone said it was and after the cost of buying them we didn't want to cause any harm to them. The owner of the campground recommend a mechanic that was just a few blocks away. We packed up and took the RV there. Keith replaced them and it was as easy as everyone said. The best part - he didn't charge us. Les kept trying to pay him and he wouldn't take any money. ~ If you are towing a car, make sure the cars parking brake is not on when you pull out. This did not happen to us, but as we were walking across the street for breakfast one morning a fellow camper was pulling out and he was leaving tracks in the gravel, as his tires were not turning. We ran to catch up with him, Nancy ran faster than she ever thought she could. He was so grateful that we stopped him, as that would have caused some major damage by the time he stopped hours later.